N and I went to Sunshine the weekend after the Big Bee Removal, I was eager to see the scene and try some honey which Aunt D reported was quite tasty on toast. 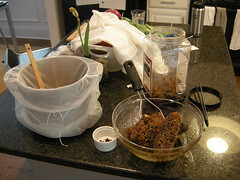 After the beekeepers removed the bees, Mom, D, and D, packed honeycomb into every container they could find. 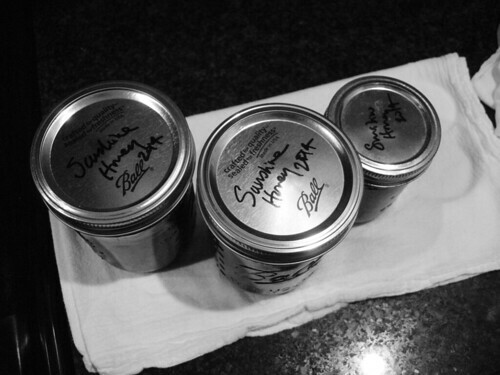 We found these in the fridge, safe from ants and other critters (but not winnie the pooh). The honeycomb was dripping initially, and most of the containers had nearly an inch of honey in the bottom but as the fridge is cold the draining process had essentially come to a halt. I decided to do a little experimenting with honey separation and put a bit of honey-filled honeycomb in a small pot on the stove. 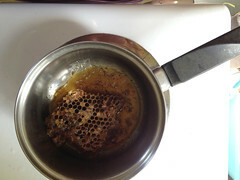 Although the honey seemed to start dripping at about the same temperature that the beeswax melted as well, I kept cooking, eventually (accidentally) boiling the honey. 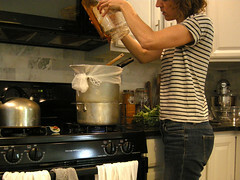 When it cooled however, the wax had separated to the top of the pot and separation was much easier. Perhaps this was a good method? I tried a little on my toast, it was excellent. When we got back to Atlanta I googled around for more appropriate methods of honey harvesting. I’ve learned through this video that honey becomes viscous enough to separate at 118°F which is still too cool for the beeswax to melt and does not constitute “cooking” which would be the beginning of pasturization and the end of producing raw honey, not that concerned me. A little more searching and I found a method much more in sync with my own ideals: crushing and straining. Did you know that you can buy a simple paint strainer, a mesh cloth, that comes in various sizes from Home Depot and use that to strain honey? I got the 5-gallon size to make sure i had enough fabric, it was too big for my pot, but I was able to tie it up well enough. After crushing my honeycomb bit by bit with a potato masher to open up the sealed holes, I transferred the dripping combs to my paint strainer stretched over a soup pot. Then, to speed the process along I created a backwards double boiler (big pot over a little one by necessity) which was just enough heat to make the honey flow faster but keep the wax from melting with the honey. For good measure i inserted a thermometer in the crumbly mess every now and then to make sure the wax temperature wasn’t getting up to 144°. My methods were imprecise but it wasn’t getting anywhere near melting. I let that sit all afternoon, “stirring” the beeswax and crystallized honey mess every now and then and eventually tying the strainer up tight to get the last reasonable bit. In the end I came away with about 2 pints of honey! This dark honey is perfectly nuanced, it has a hint of the smoke used to calm the bees and slight citrus tartness. Most of all though it tastes like sunshine smells, a little beeswaxy flavor that feels very real …it seems to be the smell of the kitchen in the summer—I guess that makes sense.